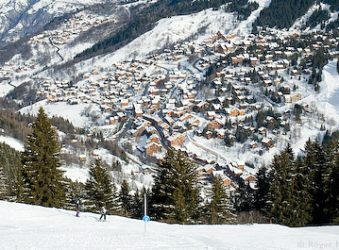 Four villages located south-east of Moutiers in the vast 3 Vallées ski area. Illustrious lift-linked neighbours include Méribel, Les Menuires, Saint-Martin de Belleville and Val Thorens. High-altitude terrain makes this one of the more snow-sure areas in the Alps. 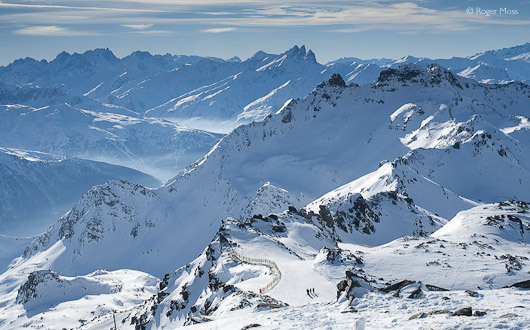 Courchevel is part of the 3 Valleys, the world's largest ski area. Courchevel's own terrain (and cheaper lift pass) could be all you need. Billed as the world’s largest ski domain, the 3 Vallées really do offer something, somewhere for all skier levels and tastes. While not exactly being in the very heart of it all, skiers based in the Courchevel sector do at least have a capable lift system which allows confident intermediates to see and ski it all, given sufficient time. The obvious proviso of setting out early isn’t just to ensure that you enjoy the best snow quality; you’ll also minimise any disruption when passing through the potential bottleneck of Méribel. 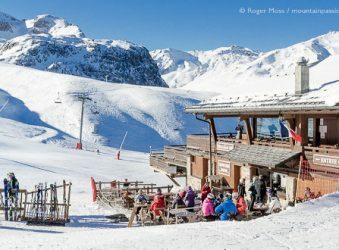 Once that’s safely behind you there are some enjoyable long, open cruises down to Saint-Martin de Belleville, a wider choice of runs into Les Menuires, the celebrated high-altitude terrain above Val Thorens and finally the largely red-graded terrain of the Orelle sector. Make it that far and your legs will be well aware that you’ve come a long way from your starting point. If the full 3 Vallées lift pass sounds like overkill, then you might just find Courchevel’s home terrain sufficiently varied and extensive to keep you happily entertained for a full week. In fact, there’s well over 1600m of vertical drop in this sector alone, and if you decide to get that figure under your skis then you’ll also discover lower villages like Saint Bon (1100m), Courchevel Le Praz (1300m) and La Tania (1400m). New for the winter 2017/18 season is the ultra-modern 8-seater Ariondaz gondola, with double the capacity (2400 pers / h), for a faster climb and greater comfort. It will be the first gondola in France to use solar-powered LED lights. And this sounds fun - they've created a 3km toboggan run (elevation: 450m), between the top of the Ariondaz lift and the front-de-neige at Courchevel Moriond. It's 8 metres wide with 4 tunnels and an average slope of 15%. 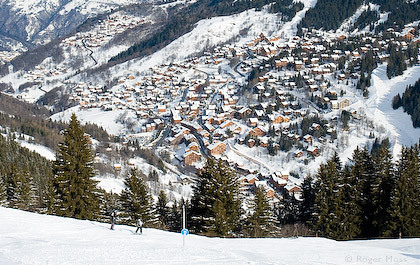 Courchevel consists of a range of villages from 1300m to 1761m altitude. Courchevel-Moriond sits at the edge of the ski area but is efficiently well-connected. 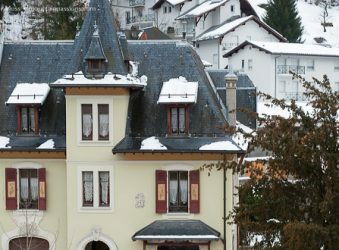 The name applies to four villages – five if you include La Tania – all of which have edged upmarket as the blue-chip ‘1850 effect’ has filtered down the mountain. 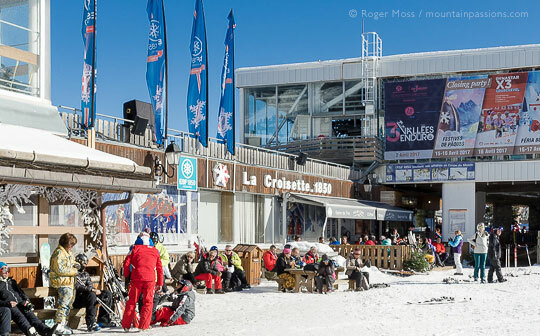 The lowest is Courchevel Le Praz (1300m), with a relaxed, traditional vibe, high-speed gondola lift access to just below Courchevel (formerly known as Courchevel 1850) and a longer high-speed six-seater chair up to 1902m above La Tania. One more chairlift ride and you’re dropping in on Méribel (a comment which applies equally to neighbouring La Tania). 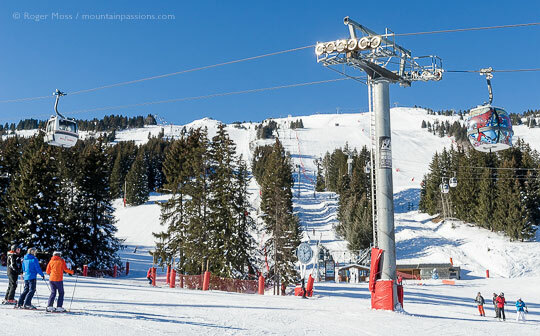 Next up is family-oriented Courchevel Village (1550m) in the Vallée du Bozel, with a choice of short chairlift rides direct to Courchevel, or a pisted run down to Le Praz. 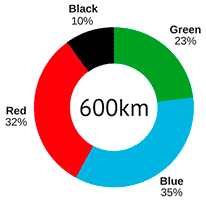 Altitude-wise, the next village is Courchevel Moriond (1650), which sits at the very edge of the piste-map, but is connected to other areas quite efficiently by a high-speed gondola and a chairlift. The pedestrian exit from its large multi-level underground car park feeds conveniently direct onto the front-de-neige. Highest of all is Courchevel, one of France’s earliest purpose-built ski developments, thanks largely to a ski-in/ski-out location at 1761m. Today most skiers based here will be heading up, rather than down, to ski the area’s extensive home terrain or heading to Méribel and beyond. 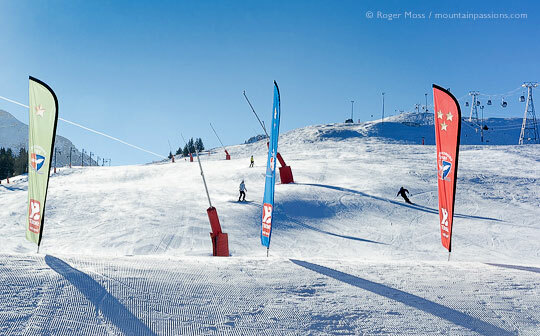 Why go skiing in Courchevel Moriond ? The 3 Vallées’ big selling-point of unparalleled mileage will appeal to those with the skill and stamina to exploit its full potential. For debutants, though, that’s obviously academic, and there are much cheaper places in which to become a skier. Plenty of people do, of course, and each village has its own reassuring dedicated beginner terrain, so it’s a viable option for families and mixed-ability groups (although low-altitude Le Praz isn’t snow-sure). Advanced skiers have celebrated tough challenges like the Grand Couloir and Couloir Tournier (both accessed from beside the Saulire cable-car top station) or discover numerous off-piste itineraries, which local guides are happy to reveal. Perhaps equally important to those who return year after year is Courchevel’s brag-value – most of your friends are going to be impressed. The reputation has substance, too – everything, from the piste preparation and capable lift system to Michelin-starred restaurants, vibrant après-ski and near-limitless bespoke services, has a premium stamp. If, on the other hand, you’re simply an intermediate on-piste leisure skier here to find out what all the fuss is about, you’re unlikely to be disappointed, as long as you’re not also hoping for an away-from-it-all experience. International celebrity status means that for most of the time you’ll have company, wherever you head. The big Family Park is equipped with a boardercross run, rails, tables and jumps but there are numerous other fun zones with an Indian or Western theme. There are trails of varying length from Le Praz, Courchevel, and Moriond. English speaking ski-school Magic Ski & Snowboard School offers tailored instruction whatever your disability. They are based in Courchevel (1850). ESF Courchevel 1650 has trained and experienced monitors. They offer Handiski lessons for people with physical and mental disabilities outside peak times (min. 2½ hours). Sessions must be booked in advance. Rendez-vous at Courchevel (1850). The luxury hotel La Sivolière in Courchevel (1850) is fully accessible to people with disabilities. Near limitless skiing for all abilities, wherever you’re based. 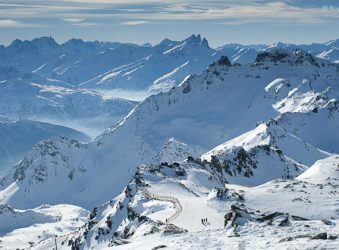 Varied terrain from gentle, forested slopes to the steepest white-knuckle pistes - and there’s unlimited off-piste. A great lift system enables you to ski from one side of the Three Valleys to the other in a few hours. Discover some of the best on-mountain restaurants anywhere in the Alps. If your budget won’t stretch that far, pack sandwiches and take advantage of picnic tables shown on the piste map, or picnic rooms such as at Verdons. Lots of free wi-fi points around the mountain. The Aquamotion Centre provides swimming and wellness options plus a range of alternative activities. A basic entrance is included in the Courchevel lift pass. Courchevel is a Famille Plus resort. All this great skiing comes at a price. Check out the ski pass options before you buy so you get the right pass for you. If you buy a Courchevel Valley pass for 2 or more days you can extend it if you wish to cover the whole 3 Valleys. Certain pistes get very crowded at the start and end of the day, even in low season. Ski in Courchevel Moriond if you don't like the crowds – there are some good, wide intermediate runs above the village. Venturing further afield? Just 2 lift rides will let you drop in on Courchevel (which the outside world still knows as ‘Courchevel 1850’) for access to the rest of the 3 Valleys. A Courchevel pass will save you money and still give you plenty of territory to explore. It goes as far as La Tania. Ski Collection offers 4* Les Chalets de la Mouria located a stone's throw from Courchevel Moriond resort centre, which can be accessed by the escalator or the free shuttle bus. The ski slopes and lifts are just 250m away. 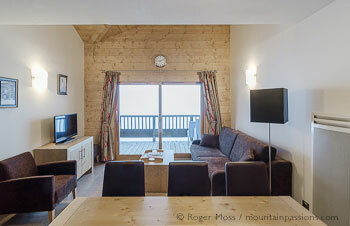 This self-catered accommodation complete with on-site spa, provides an ideal base for a Courchevel Moriond ski holiday. Whether you’re staying in apartment or hotel accommodation, this is a great location for quick and easy access to the slopes. At the end of the day, simply ski back to the door on an easy piste. Those with ski school commitments couldn’t be better placed, with meeting points for classes and the ESF Piou-Piou Club for toddlers both on the doorstep. 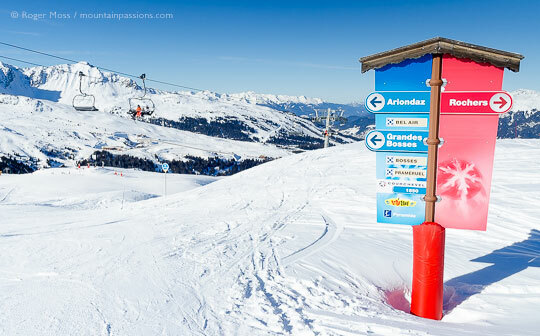 The Ariondaz gondola lift is just a few steps away. We stayed in a one-bedroom apartment sleeping 2-4 (27m2) though we wouldn't recommend it for more than one couple, as space is very limited. There’s a living area with double sofa-bed, dining table and chairs, minimally but adequately equipped kitchen area with dishwasher, ’fridge, microwave and full-size hob; bathroom and separate WC. Clothes storage is in a cupboard off the corridor which, once you’ve unpacked, actually works OK. We were disappointed by the bedroom, though, which had no reading light or bedside shelves, and was only just big enough for the (comfortable) double bed. The balcony overlooked a side-street, although with reasonable views to the front de neige and surrounding mountains. 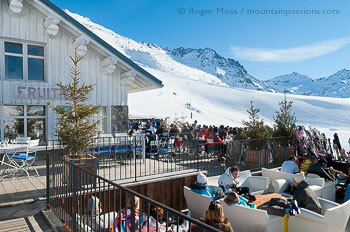 “Marki’s” – the hotel’s piste-side bar – is ideally located for people-watching and prices for a beer start at 4,50€. 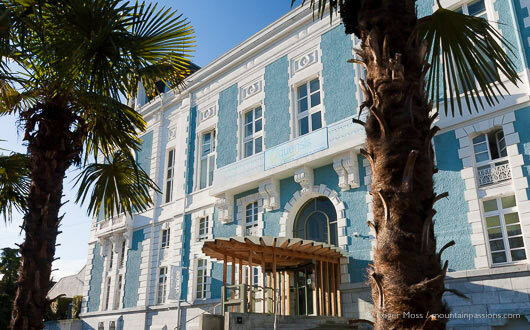 The Cimes Blanches public car park is very convenient, with direct access to the hotel and residence apartments but is payable (you can reserve a space in advance online). The hotel reception is beside the car park entrance. Park close to the lifts - either Résidence Le Lac or Les Cascades - and off-loading luggage becomes easy. 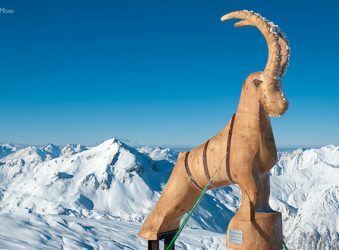 Courchevel is a Famille Plus ski resort and offers activities for all ages each day. Visit the courchevel.com website for details. Definitely worth a visit is the Aquamotion centre situated just below Courchevel Moriond. You can walk down or descend (and return) via escalators located opposite the Tourist Office – if you’re driving there’s underground parking at the Centre. A basic entrance to Aquamotion is included in a Courchevel lift pass of 2 days or more. Open daily from 10am - 8-30pm, there’s the Aqualudique fun pool (65€ adult tarif for 6 days), a surf wave, water flumes etc. For simple relaxation there are indoor and outdoor lagoons with aero baths, bubbles, jets, showers, saunas, steam rooms and salt water grotto. Also available are relaxing Spa & Balnéo treatments. Open from 9am until 7-30pm, this 2.5km floodlit toboggan run starts at the top of the Grangettes gondola and snakes its way down through the forest between Courchevel and Courchevel Village 1550. The lift is free after 5pm, so this is a great way to have fun after the slopes have closed. Indoor ice rink, sports hall, climbing wall and bowling plus shops and restaurants – great place to end the day or for indoor entertainment during in bad weather. Fine cuisine – or a burger? With 21 Michelin stars and 12 gastronomic restaurants, the Trois Vallées ski area is renowned for its fine cuisine. We’ve sampled one or two, but for most of the time we’re looking for down-to-earth prices and tasty, satisfying mountain food. If the ubiquitous pizza (starting at around 10€ for a Margherita in Courchevel Moriond) doesn’t appeal, try La Folie Douce at Méribel or Val Thorens for appealing restaurant menues in the dairy-themed La Fruitière restaurants, which champion local ingredients. Alternatively, head to its Petite Cuisine for a pasta/burger-type snack, if that’s more your style. We can also recommend La Voute in the village at SaintMartin de Belleville, with a café ambiance and a good plat-du-jour at a reasonable price. For cheaper lunchtime meals, prices start at around 12€ for burgers or panini, frites and a drink. We ate at Le Chrome Bar at the foot of the pistes in La Tania, which offers a vegetarian, fish or beef burger, chips and a beer for 12€. We also found Les Castors snack and takeaway to be good value and friendly. Situated near the foot of the Tougnette 1 lift in Méribel centre, we paused to grab panini, frites and soft drinks, again for 12€. Autoroute A43 Lyon / Albertville, then N90 to Moutiers. Follow the signs for Courchevel on the D915. Turn right on to the D91a which takes you via La Praz and follow signs for Courchevel 1650 (or Courchevel Moriond). 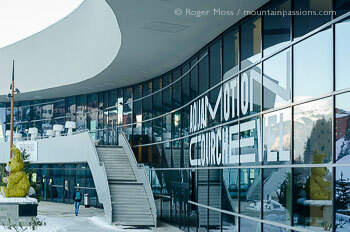 Pass the Aquamotion Centre on your left, climb the hill and you’ll enter Courchevel Moriond after one final bend. Other low-cost flights are available from throughout the UK. Transfers are just 1¼ hours from Chambéry Savoie Mont-Blanc, while Lyon, Geneva, and Grenoble all lie within 2 or so hours. Arrive in style with private flights into Courchevel Altiport by fixed-wing aircraft or helicopter. Ski trains run throughout the winter and take you direct into Moûtiers, from which you can organise a transfer. Driving up from Moûtiers to Courchevel Moriond reveals just how much things have changed since our previous visit, with lower villages having benefitted noticeably by association with blue-chip Courchevel (formerly Courchevel 1850). Courchevel Moriond follows suit, and keeps its ski credentials largely hidden from those passing through en-route for the topmost spot. Skiing from Courchevel Moriond, whether you’re a day-visitor or planning to stay, means getting to know the Cimes Blanches public car park – initially a slightly bewildering experience, for which the payback is great convenience, since there’s direct access to the lift pass office and ski lifts on the front-de-neige (shown above). For us the even better news is that there’s also direct access to our apartment accommodation at the adjoining Hotel Les Cimes Blanches. That’s just as well, since parking, like most things here, doesn’t come cheap. 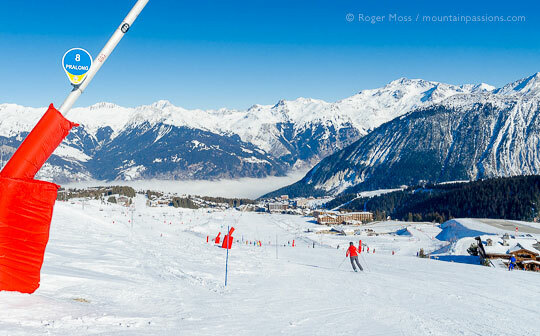 Skiing back to the foot of the pistes at Courchevel-Moriond. It's easy to travel long distances using the efficient lift network. Passing the Altiport into Courchevel 1850. After picking up our lift passes we hop into one of the cabins of the adjoining Ariondaz high-speed gondola lift. Updated for the 2017/18 season, Ariondaz is now an ultra-modern, high-speed 8-seater lift. The haul up to Mont Bel-Air (2052m) gives us a useful overview of things on this side of the mountain, passing between mostly gentle, green-graded terrain before climbing more steeply, as green runs give way to blue and then red grading. At the top there’s a simple decision to make if you intend to remain in the Courchevel Moriond sector: either ski back down to the village on a choice of mostly wide, undemanding pistes or take a red or blue cruise over to the Chapelets six-seater high-speed chairlift serving three rewarding reds which drop from Le Signal (2250m). During our stay, though, snow conditions make us more inclined to join the many skiers taking the third option of following an initially gentle blue down to the foot of another nearby lift. Down to Courchevel or continue to Méribel? The powerful six-seater Aiguille du Fruit chair (below, left) hauls us up through the tree-line and over a couple of ridges before dropping us a few minutes later at 2400m. From here it’s a gentle run all the way down into Courchevel, with overviews of air traffic movements at Courchevel’s famous Altiport to make things a little more entertaining. It’s an easy liaison, and if you’ve set your sights further afield then transferring from the Aiguille du Fruit chair to nearby Marmottes six-seater or the slightly-longer four-seat Suisses will get you up to La Vizelle (2659m) for a choice of fairly steep onward runs into Méribel Mottaret (1750m), Méribel Centre 1450m or all the way down to Méribel Village (1400m). If you’re not a confident skier (the pistes can get quite churned up, due to the number of skiers heading down) the Saulire Express offers a gondola ride down. Courchevel 1850, the heart of the network of lifts and where skiers pause to appreciate their surroundings. La Croisette, Couchevel 1850, where skiers are relaxing in the sun. We take the Altiport piste and head past the world’s steepest international airport until the piste eventually feeds onto the super-wide Verdons for the classic final approach to Courchevel’s front de neige. We don’t stop just yet, though. Instead we let our skis run until we reach Courchevel Village (1550m), looking noticeably quieter and less the place to be seen than its hip neighbour. To get back to Courchevel we could have taken the six-seater Tovets chairlift but opt for the slower Grangettes gondola, whose slightly higher arrival point drops us conveniently right in the heart of La Croisette. It’s a good place to be, since on the opposite side of the complex are the departure points for three gondola lifts: Chenus, Verdons and Jardin Alpin. In addition to serving gentle novice terrain, the latter also drops skiers above the Biollay chairlift, for access to the Saulire cable-car. 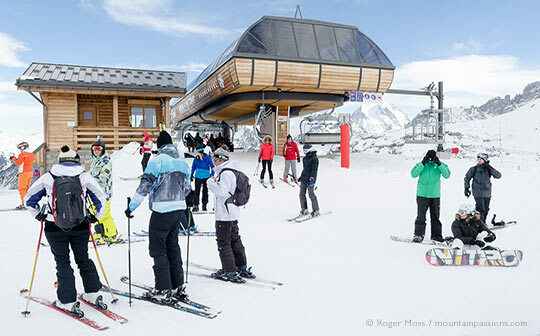 That makes it a viable alternative to the longer, more direct Verdons gondola which most skiers heading for Méribel and beyond via the cable car will be taking. For now we take Chenus, which heads up to 2238m for a choice of descents into La Tania. They turn out to be quite steep, with tree-lined lower sections – one of the attractions of being based on this side of the 3 Valleys, particularly if winds or poor visibility compromise things higher up the mountain. As for La Tania, yes, it’s high-rise but not unpleasantly so, and its sheltered location, friendly vibe and down-to-earth prices make it a great lunch-spot. Heading up from La Tania – to where, exactly? We’ve covered some distance from Courchevel Moriond to reach La Tania but we’re still within the area covered by the Courchevel Valley lift pass. With 150km of pistes and over sixty lifts, that’s more than you’ll find at even some linked-domain ski areas elsewhere – and we still have the pistes of Courchevel Le Praz (1300m) and Saint Bon (1100m) to explore. That obviously requires good snow cover, in view of their more modest altitudes, but the pistes are mostly graded red, you’ll be below the tree line and you can clock up an impressive 1640m or so of vertical drop between Saulire and Saint Bon. From the bottom a free shuttle bus will get you back to Courchevel Le Praz for a choice of lifts, depending whether you’re heading for La Tania or Courchevel Village. During our days skiing from Courchevel Moriond we were armed with full 3 Valleys passes, which enabled us to head further afield via Méribel. 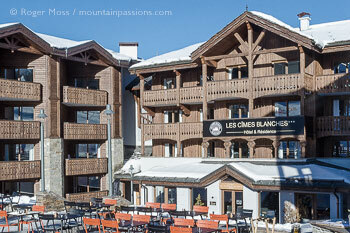 If you’ll be doing the same be sure to read our Independent Resort Reviews of Les Menuires, Val Thorens and Orelle. Yes, it sits right on the edge of the piste map and might not look like an obvious choice, but that means that so far at least there’s a refreshingly unpressured vibe. Word is getting out, though, and Courchevel Moriond’s fortunes are clearly in the ascendent. As for the skiing, we enjoyed the local terrain, and soon came to know the routes to and from Méribel. 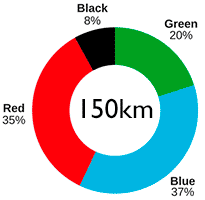 How much distance you can cover will depend on snow conditions and your skiing/fitness level. If both are good then plan your route carefully in advance, set out early and you should be able to ski over to the Orelle sector and back in a day. You just have to hope that not too many other skiers have the same idea – not surprisingly, steeper key pistes can become moguled from mid-morning onwards, which can slow progress, as can peak time lift queues in Méribel Centre. Come outside school holidays, though, and you’ll enjoy premium skiing, great grooming, a capable lift system and near-limitless terrain to explore at your own pace. The rest is up to you. Piste signage at Courchevel Moriond. Creux – a long, blue-graded cruise from Saulire to the foot of Aiguille du Fruit & Roc Mugnier lifts. 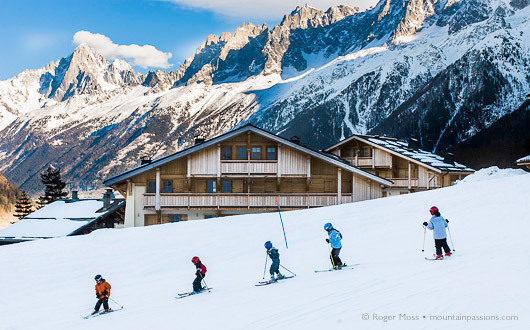 Biollay, Pralong & Verdons – wide cruises for carving, and the classic approach to Courchevel. 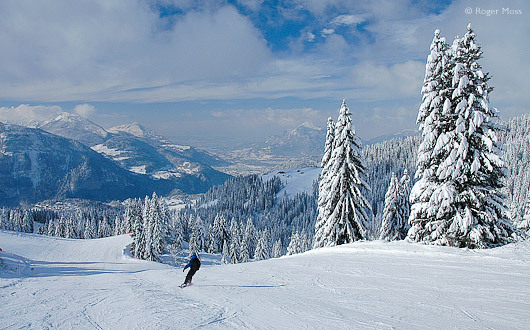 Folyères – a winding, tree-lined drop into La Tania. Jerusalem – an unforgettable roller-coaster ride to Saint Martin de Belleville.